It’s easy to increase your home’s energy efficiency and comfort, while reducing your heating bills this winter. All around the house, there are ways to increase the “cozy quotient”, take the “chill out of the air” and save money on your energy bills. Plus, you’ll enjoy current Federal Tax Credits for many improvements. Reduce drafts by placing plastic plug protectors into outlets and foam inserts behind outlets & light switches that are located on perimeter walls in your home. Storm windows in older windows help reduce heat loss. “Shrink film” window kits will also help, especially on drafty sliding glass doors. 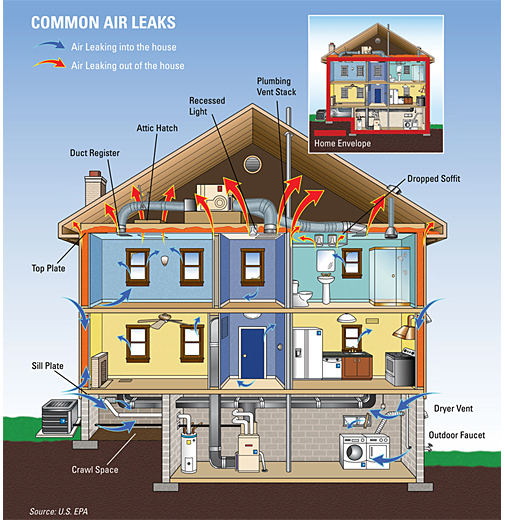 Seal air leaks around doors and windows with non-toxic caulks and weatherstripping. Thermal drapes, kept closed at night, will help block cold air from entering your living spaces. Open the drapes during the day, especially on south-facing windows to allow sunlight to help heat your interior. Also, clean windows allow the most sunlight to enter. Seal cracks, gaps, and holes in attic floorboards, basement ceilings, and around chimneys and recessed lighting, with a can of spray foam insulation. Insulate your pull-down attic door with an attic door cover or tent. This will keep heated air in your living spaces in winter, and in summer months, will keep hot air out of your living spaces. Weatherstripping around the attic door will also help. Install an Energy Star qualified programmable thermostat to avoid wasting heat while you’re away from home or asleep. Wrap your older-model hot water heater tank in a water heater blanket if it’s located in unheated space. If it’s time for replacement, consider a tankless model which uses both energy and water significantly more efficiently. Get your heating system inspected and maintained annually to keep it operating efficiently. Operate your fireplace safely and efficiently by following these tips. Check the level of insulation in your attic (enter your zip code at Oak Ridge National Laboratory’s website to find the proper amount of insulation needed in your area). It’s likely too low, especially if you live in an older home, so, add environmentally-friendly insulation like recycled cotton or cellulose insulation (be sure to seal air leaks first). film is in with the best of making a house more energy efficient because it keeps he cold out in winter and locks warmth in, in summer.